An overview of the scaffolding that appears in each workbook. Looking at image above, you can see that the authoring interface for a workbook is divided in a left- and right-hand part. The left-hand side allows you to navigate between this chapter's workbooks and create new workbooks for this chapter. Navigate between workbooks by simply clicking on them in the left-hand side. The right-hand side is where you actually edit your workbook. The workbook with its exercises is fully represented by a spreadsheet with multiple sheets. We call this spreadsheet the workbook source. Looking at the interface, you might already guess how you'd create a new workbook. You can simply click on 'Add New Workbook' on the left-hand side. This will create a new workbook with one exercise scaffold in it. In the scaffold workbook source, you'll see a few sheets. The first sheet is called Golden Copy. This is the data you'll be using throughout the exercise of that workbook. The golden copy will be copied fully to each student's workbook copy for that exercise. All data of the golden copy will be preserved for the student. Even the more complex features that can be assigned to a cell, like conditional formatting, will be preserved through the golden copy. This is not the case for the solution or sample sheets of exercises. More on this in the section about the exercises. Sheets in the workbook source that start with 'Exercise ...' are called the exercise sheets. Later in the sections about exercises, we'll talk about which data is preserved from your exercise sheets. You'll see that the Golden Copy sheet, in contrast to exercise sheets, retains all data, including things like conditional formatting. This provides the student with a better experience as they transition between exercises in the same workbook, using the same Golden Copy. Other than the Golden Copy and exercise sheets, you can add read-only sheets to your workbook source. These can contain source data, that can be used throughout the exercises of a workbook. If you delete the Golden Copy sheet and have (a) read-only sheet(s), those will be the only ones that are shown to the student. This can, for example, be useful when the student needs to create a new pivot table in an exercise. The student starts out with only a read-only sheet and creates a pivot table from that. The correctness checker for SCTs (check_pivot) will automatically check the newly created pivot table. If you delete the Golden Copy sheet and have no read-only sheets, the student will see a blank sheet called 'Sheet1'. This because a workbook can not be completely empty, without sheets. 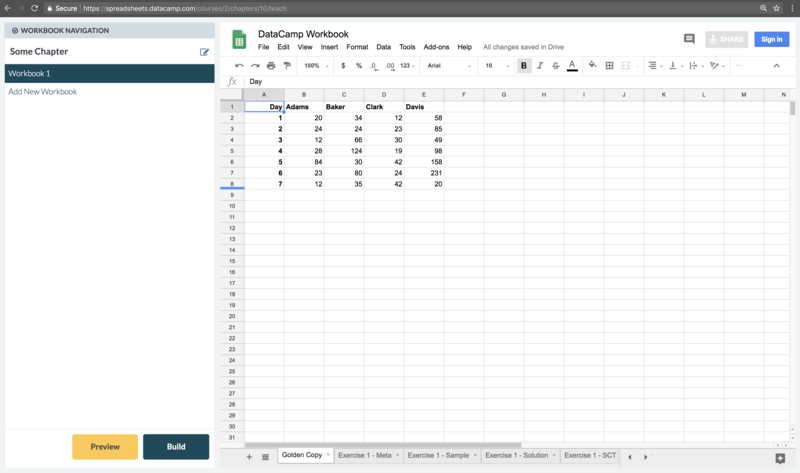 Workbooks are edited through the spreadsheets interface itself. We do this through the workbook source, which contains all information related to a specific workbook and its exercises. You can find the workbook source on the right-hand side in the chapter authoring interface. In the workbook source, you'll find the Golden copy sheet as mentioned above. You can simply edit this sheet, and all of its content will be copied a sheet named 'Sheet 1' of the student's worksheet when they start an exercise of this workbook. Between the Golden Copy and the first exercise sheet, you can add an arbitrary amount of read-only sheets, as described above. These will be copied to the user's workbook copy when they open an exercise. Remember that these sheets can not change throughout the exercises of the workbook. We'll talk about editing exercise sheets in the section about exercises. Each time you made changes to the workbook source, be sure to hit the Build button afterwards. This goes through your workbook source and (re)builds it into its exercises. Once the build is ready, you can preview it hitting the Preview button. This will open a new window to the rendered chapter you're currently editing. It will automatically refresh if you build again and things have changed.